"My grandmother is Scottish and her family made GREAT scones.... 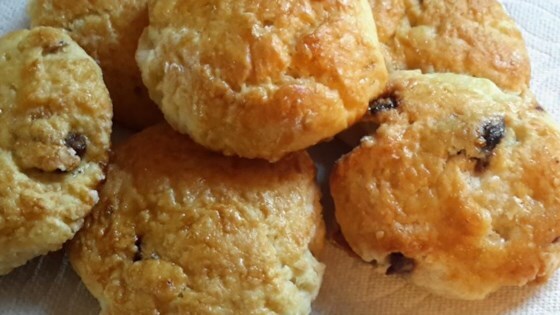 In search of the best scone recipe in the world I have adapted their recipe with my own touches and with the famous scone recipe from the world renowned Savoy hotel in London. I now believe I have adapted the BEST SCONE RECIPE IN THE WORLD!" Sift the flour, baking powder, sugar and salt into a large bowl. Cut in butter using a pastry blender or rubbing between your fingers until it is in pea sized lumps. Stir in the currants. Mix together 1/2 cup milk and sour cream in a measuring cup. Pour all at once into the dry ingredients, and stir gently until well blended. Overworking the dough results in terrible scones! With floured hands, pat scone dough into balls 2 to 3 inches across, depending on what size you want. Place onto a greased baking sheet, and flatten lightly. Let the scones barely touch each other. Whisk together the egg and 1 tablespoon of milk. Brush the tops of the scones with the egg wash. Let them rest for about 10 minutes. Bake for 10 to 15 minutes in the preheated oven, until the tops are golden brown, not deep brown. Break each scone apart, or slice in half. Serve with butter or clotted cream and a selection of jams - or even plain. As the recipe title claims, these just might be the World’s Best Scones! Scones can be reheated if not eaten promptly by wrapping in aluminum foil and heating in oven until heated through or split in half and toasted.